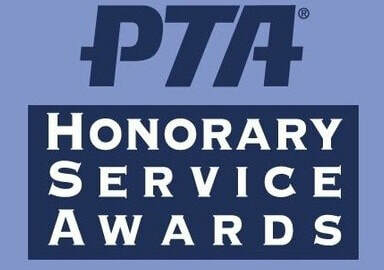 The Pinetree PTA has the honor of awarding special recipients with Honorary Service Awards. These awards are given to recognize an individual or organization for outstanding service to children and youth in our community, going above and beyond what is asked of them. All funds collected with this program are used exclusively to support the California State PTA scholarship and grant programs. 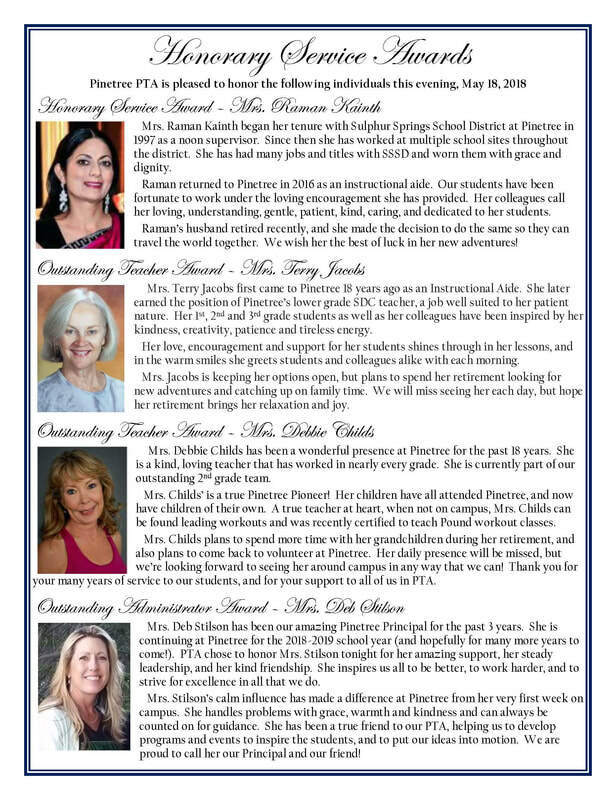 Here are a list of the people honored to have received a Honorary Service Award from the Pinetree PTA over the past several years. Wife of Andy, mother to Hayley and Andrew, teacher, friend and loyal Patriot's fan. She was dedicated to her students and worked hard for their benefit. Many of you may have that patchwork elephant art project, Elmer, that she created hanging up in your home. She touched hundreds of lives and she is missed daily. Was a Substitute teacher on our campus, and he was a favorite among our students. We are thankful that he spent his retirement teaching our kids. Was a dedicated mother and former PTA president from 2005 through 2007. She created Celebrations Around the World (CATW), a multicultural event that invites families to share their heritage and customs with our school community. Many other schools have adopted this event and we thank Kim for this legacy. Newly retired office staff member, had been a fixture at Pinetree for countless years. She began as a parent, PTA member than office staff. She had been supportive of PTA and was always available to offer her advice and knowledge. She was also responsible for putting the track in her at Pinetree. Thank you Stacy. Office Manager has worked at Pinetree for many years. She helps in so many ways and does so many things to assist PTA wherever is needed. She supports many school events, fundraisers and projects. She is involved and is our go-to person for nearly everything. 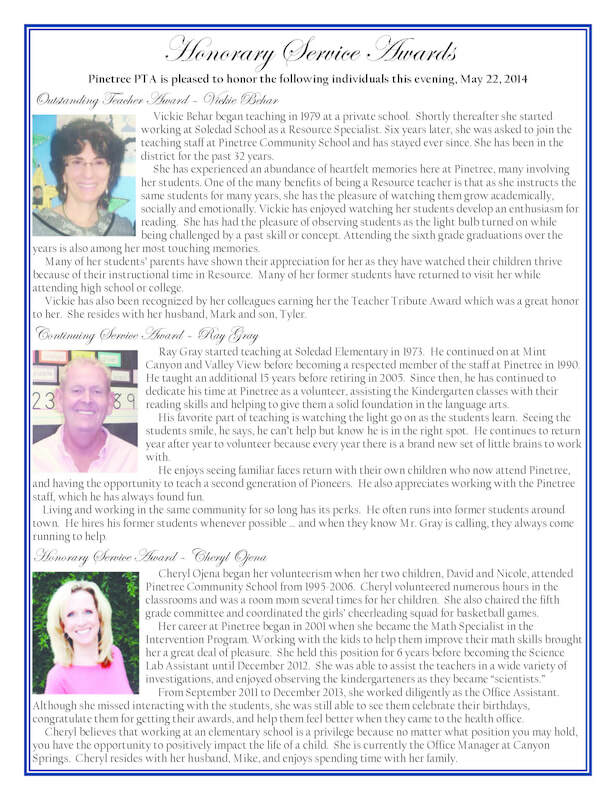 Thank you Jan.
Mike Adachi, Sixth Grade Teacher and Gay Evans, Kindergarten teacher deserve so many kinds of awards. PTA is honoring them tonight for their involvement this year. They are faithful teacher representatives as they come to the meetings. They both served on the nominating committee which helped to set up next year's board. They both took on projects that they didn't have to do but they saw a need and addressed it. They are spectacular teachers and we are so grateful for them. Is one our silent volunteers. He is the one responsible for setting up the recycling system and he also takes care that it is done on a consistent basis. Ms. D'Anna also stated that Patrick helps us with the safety and disaster bin. Thank you Patrick. She came to us four years ago and she has brought changes and new ideas. She has guided us through some tough economic years for our school. Despite the economy, Ms. D'Anna has ensured that our students receive arts education, technology and teacher training for our site. Pinetree falls in the middle of the spectrum but we know she has our back when it comes to our school. She is a fierce advocate for our students teachers and our school. We are all thankful for her support. 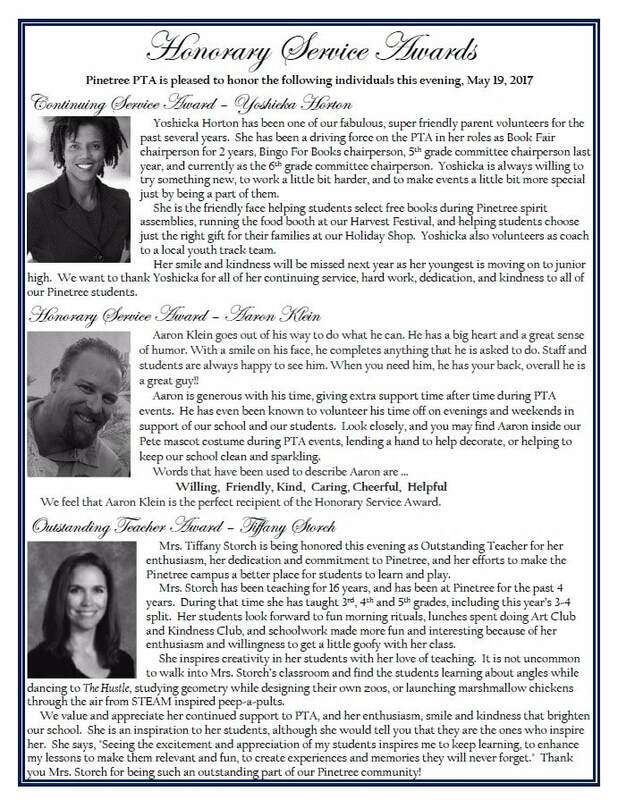 Jan Evans, the office manager of Pinetree, was recognized for her constant support of the PTA over the years. Patrick, a parent and PTA Member initiated Pinetree's recycling program. He provided the bins and empties the recycling containers for paper and plastic bottles and cans. The funds received go to the School Student Site Council.